March 3, 2014 - DGM a leading manufacturer of folder gluers for the folding carton and corrugated industries, die cutters, hot foil stampers and carton lamination machinery and PPC Technologies & Solutions LLC (PPCTS) have concluded a distributor agreement for the complete DGM range of equipment for the USA and Canada markets. PPCTS having recently expanded and opened a new demo center in Waukesha WI, will install and showcase a new DGM Smartfold™ 1100 Intelligent folder gluer, in line with their IMPACK ERGOSA™ PERPACK™ Universal Folder Gluer Packing system for customer demos, testing and training. 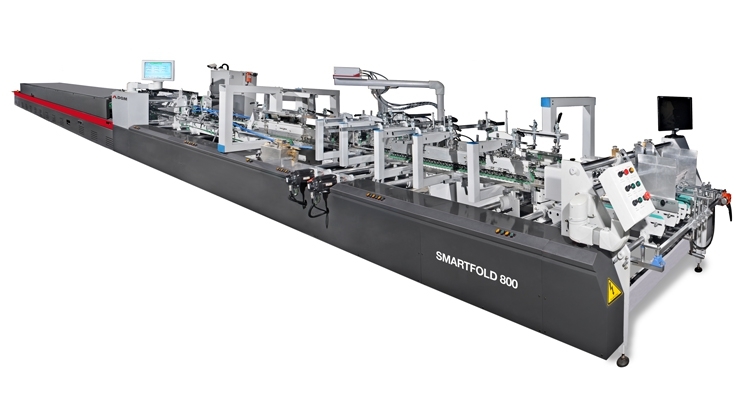 The new, state of the art, DGM Smartfold™ 1100 will be equipped with motorized carriers that include job recall, servo drives and back fold systems, and able to produce and test complex carton structures, mini-box, pocket folders, straight line, auto-lock bottom, 4 & 6 corner cartons and more. With over 20 years of design and manufacturing experience, DGM is one of the leading suppliers in the Southeast Asia and China markets. DGM counts machinery installations in over 25 countries with more than 5000 units sold, and a steadily growing export presence that include the America's, as well as Eastern and Western Europe. Richard McDonald, President of PPCTS, noted, “We are extremely pleased to add the "new generation" DGM folder gluers and converting lines to our current offering of IMPACK Folder Gluer Packing Solutions. Our new demo center will showcase a complete state of the art solution for the folding and gluing needs of today's converter, from feeding to packing, with one of the best cost/value/productivity equipment combination to be offered to the market. DGM's Smartfold™ and Megafold™ folder gluer lines offer high technology and productivity at an affordable cost. Our new demo center will allow us to demonstrate the capabilities of this complete solution". The PPCTS demo center is located in Waukesha WI, a western suburb of Milwaukee, within easy driving distances from the Milwaukee WI and Chicago O'Hare airports. The demo center will be available for customer demos, testing and training and an open house for USA and Canadian converters is the planning stages for May/June 2014. For more information on the DGM line of folder gluer equipment and the PPCTS demo center, please contact PPCTS at 262-695-7536 or visit their website at www.ppcts.com.